Tom Daley says he is "happy" with winning two medals on his return to international diving since becoming a father in June 2018. Britain's Daley won silver in the men's 10m platform and bronze in the mixed 3m synchro with Grace Reid at the season-opening Diving World Series in Japan. The 24-year-old last competed for Britain at the 2018 Commonwealth Games. "All the things I've been working on have been coming together and I'm feeling good," Daley told BBC Sport. "The standard was so high in both events and all of the finalists went over 500 in the 10m and all went over 300 in the 3m and I can't remember when that last happened. "If anyone had said I was going to come into this with 580 points, I would have taken that and ran with it." Daley, who won gold in the 10m synchro with Dan Goodfellow on the Gold Coast - the same partner he secured Olympic bronze with at Rio 2016 - was keen to experience competing in Japan, the location for the Olympics in 2020. He also finished fourth in the 10m synchro in Japan with new partner Matty Lee. Daley said: "There's lots of things about Japan I need to get used to. "The food is different, the culture, the size of hotels are different, the climate, the time change are all different, and it's good to be here and to get used to that." 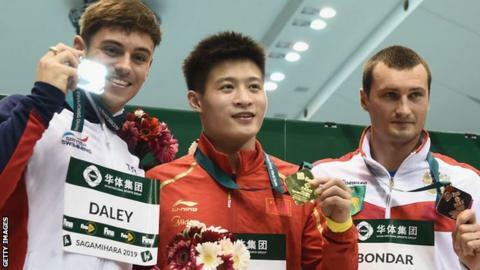 The next World Series event will be held in China, where Daley will come up against Yang Jian, who beat him to gold in Japan with an impressive final dive, while Russia's Aleksandr Bondar came third. The Plymouth-born diver said: "More performances like that would be nice. I'm looking forward to competing in synchro again. Coming fourth was promising and I'm looking forward to giving it another go with Matty in China. "It's always tough competing against China in China, but I'm going to give it my best shot and it's nice to know I'm going into it thinking 'yeah, I can dive like that'". In his first competition on home soil since taking a career break, Daley won gold in the 10m synchro with Lee in the National Cup in Plymouth last month, where he also won gold in the individual 10m platform event.